Fascinating sundials can be used as a focal point in the garden or as a learning and educational tool. However you place them in the garden they give hours of enjoyment to both young and old. Sundials come in a range of materials including metal, stone, timber or brass. They have been a feature of gardens for centuries and are available for sale in both traditional and modern designs. Sundial are, not only for telling time but also as an architectural feature or focal point. Developed from shadow stick and obelisks, sundials were way of telling time for many years. For children sundials can be a great learning tool, and for adults a source of fascination as well. 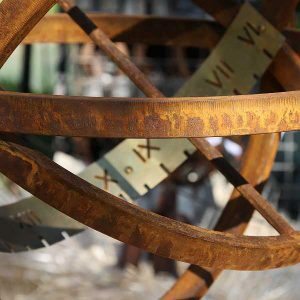 So be it for an educational experience or for aesthetic reasons, a sundial, or maybe an armillary sphere could be a great addition to a garden, courtyard or patio. With hand crafted metal stone or timber sundials available in both classic and contemporary styles you will be sure to find a design to suit your garden or courtyard. Consider placing a sundial on top of an ornamental garden pedestal to help create a stronger visual impact. You could also consider an Armillary Sphere, this is an instrument used in astronomy.